As the days grow darker and colder, it’s that time of year again to layer up and fantasize about warmer places. Why not embrace the season and experience the joy of a winter weekend break? Holidays in many cities across Europe are cheaper during the winter months. Or you might decide to get into the festive spirit by splashing out on a luxury stay. Whether it’s a family fun trip, a romantic getaway for two, or just a peaceful weekend for one, there are plenty of places to choose from. 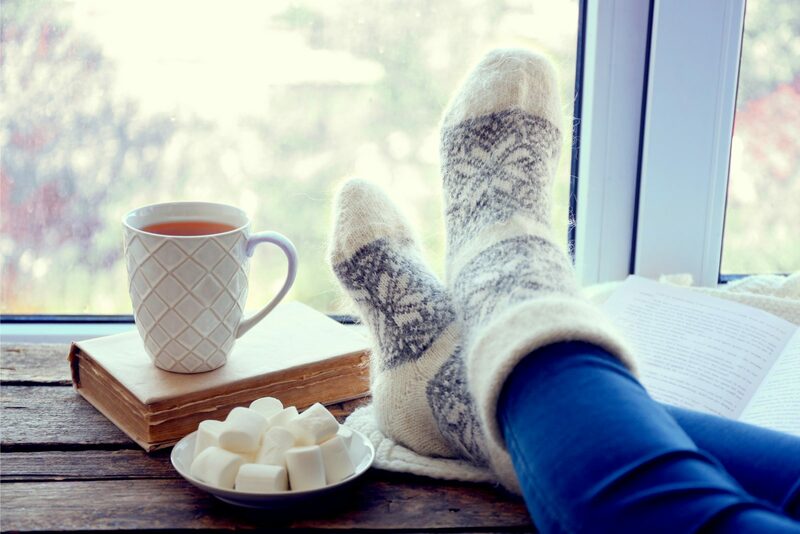 You can put your feet up by a fire or face the weather head-on with outdoor activities. Of course, one of the best things about the season is the Christmas markets. Here are ten wonderful winter weekend destinations to consider if you are planning a short break. There will be something to suit every traveller’s budget! If an indulgent winter getaway is what you’re after, the perfect solution may be closer to home than you think. 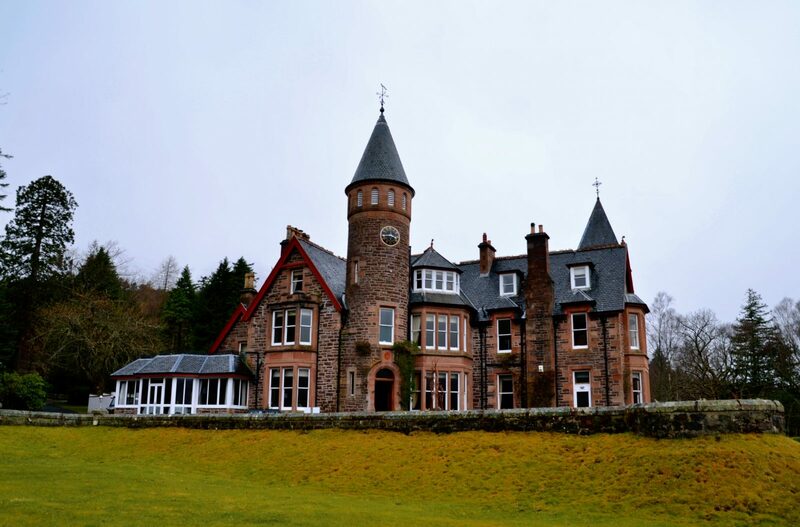 In the Wester Ross region of the Northwest Highlands of Scotland, you will find the Torridon Resort. With almost 60 acres of parkland and a sea loch nearby, it can provide a variety of eventful experiences. The finely-furnished hotel has 18 bedrooms, some with free-standing Victorian-style bathtubs in addition to views fit for a king. For more privacy, you could book the self-catering converted boathouse down by the water’s edge. For cosy group accommodation, there are ensuite family, twin, and double rooms around a courtyard at the Torridon Inn. The 1887 hotel restaurant offers exquisite cuisine, plus you can warm up in the Whisky & Gin Bar. The Inn offers comforting pub food, or pre-book a special afternoon tea to elevate your stay. There is plenty to do at the Torridon, as well. The activities include walks, mountain biking, archery, clay pigeon shooting, kayaking, coasteering, cycling, and more. Hire a classic Morgan car to drive the North Coast 500 route, or book their astronomy experience for stargazing excursions in the highlands. If you don’t want to travel too far, and especially if you’re the active type, head to the Brecon Beacons National Park in South Wales. It is the perfect place to take bracing winter walks and enjoy the snowy scenery. Wrap up warm and head out on any of the 1,200 miles of trails. You can stop off at a tearoom or cafe to enjoy hot drinks and delicious baked goods. Or spend the evening in a historic pub – inns such as The Bear even have a fire for you to sit beside. Return to a cosy cottage as your accommodation for the weekend. There is a variety of holiday cottages to choose from in the Brecon Beacons. Depending on your budget, you can book one with a fire or wood burner, a BBQ, a hot tub, or located close to a fishing spot or a pub. Some of them allow pets if you want to bring the family dog along. There are larger lodges for groups or cosy cabins for couples. 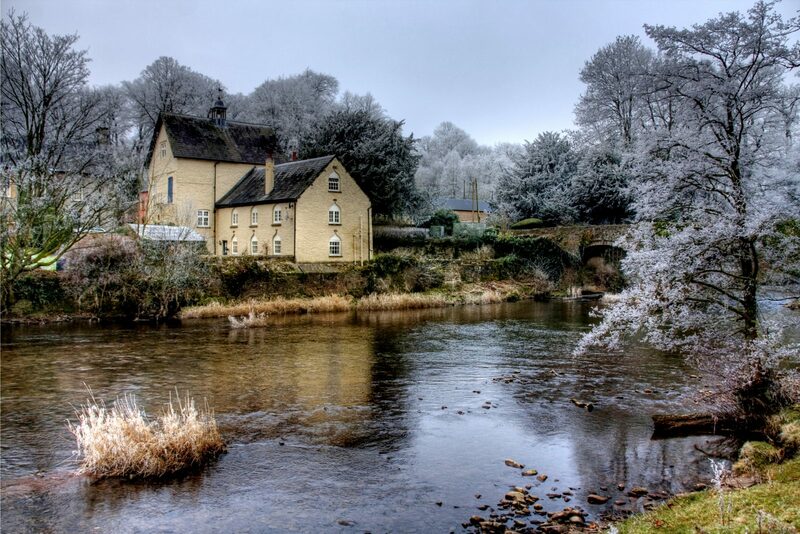 Everything from the landscapes to your lodgings will look as picturesque as a Christmas postcard. The Brecon Beacons is also an International Dark Sky Reserve, so it is a perfect place to go stargazing. There are also many community Christmas fairs and markets across the region. The Black Forest in Germany is known for its history of hauntings and local spooky legends. 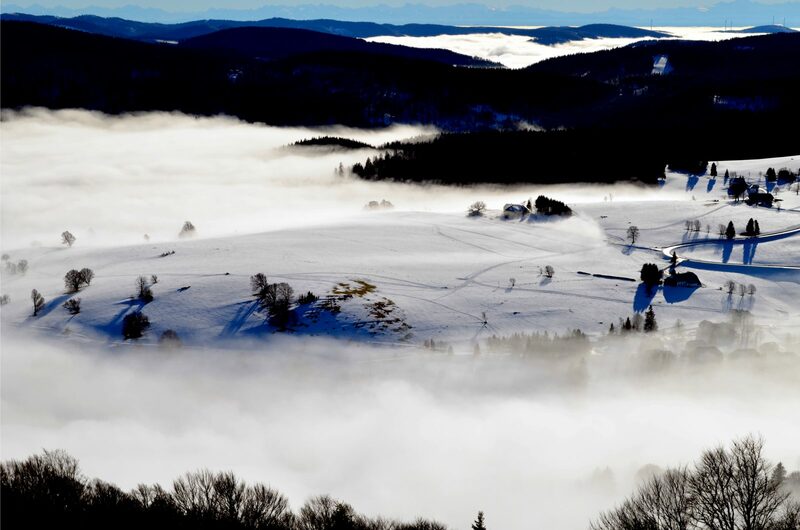 Whether you believe it is home to witches and werewolves or not, the Black Forest region is one of the most beautiful in Germany during the winter. It is the country’s largest nature park, featuring grandiose landscapes of snow-covered mountain peaks and trees. There are hundreds of villages and thousands of places to stay. Depending on the type of trip you want to have, you can choose from hospitable hotels to guesthouses or farms. You could stay in an apartment or on a campsite, whether in a tent, caravan, or hut. Wherever you choose to stay, you will be within travelling distance of some great attractions. Go hiking on the Black Forest trails, or go skiing and tobogganing on the snowy slopes. If winter sports aren’t your thing, you can relax at a spa with natural locally-sourced treatments. Appreciate culture and heritage by visiting the historic castles and churches. Enjoy traditional snacks from the area such as Vesper with matured ham, and cakes like Gugelhupf or Schwarzwälder Kirschtorte. And don’t forget the fairytale markets! 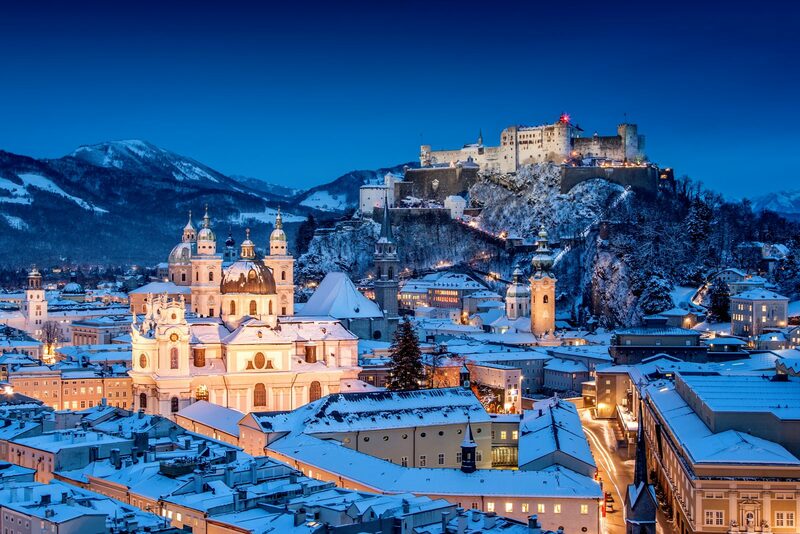 Salzburg in Austria is known as “the city of Mozart” because it was the birthplace of the world-famous composer. It was also the shooting location for the classic 1965 film The Sound of Music. Salzburg is a UNESCO World Cultural Heritage site, so there is a lot to see and do. Winter is one of the best times to visit, when Advent celebrations take over the city. Salzburger Christkindlmarkt is a traditional Christmas market held beside the cathedral. It has around one hundred market huts and stands, plus daily events like parades and choirs. There is also a beautiful market in the palace courtyard of Schloss Hellbrunn. It is child-friendly with a petting zoo, pony rides, and sausage grills. You can go ice-skating on Mozart Square or take a guided tour of the city in a horse-drawn carriage. Winterfest at the Volksgarten features a series of circus acts, while Advent Singing at the Grosses Festspielhaus showcases Alpine musical folk traditions. You might also witness the customary Krampus and Perchten parades. 2018 celebrates the 200th anniversary of the classic carol “Silent Night” which originated in Salzburg, so it’s a fitting festive destination. Which destination is more festive for a winter holiday than the capital of Lapland in Northern Finland? 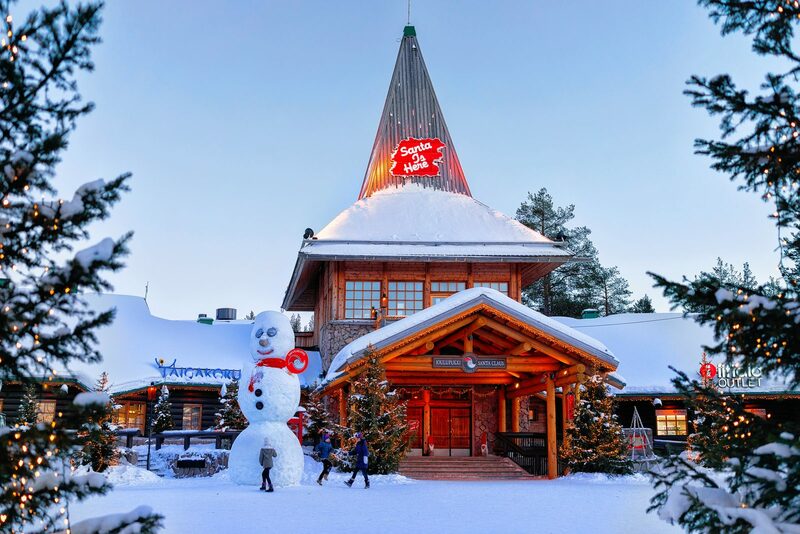 Rovaniemi is the “Official Home of Santa Claus,” making it ideal for families with young children. Or even adults who just want to believe in Christmas magic! With a population of 60,000, the town is the largest hub so close to the Arctic Circle. It attracts tourists from all over the world, especially at this time of year, so it is likely to be more expensive. However, it is definitely worthwhile as such a unique experience. You can visit Father Christmas himself at his Post Office in the Santa Claus Village, and even ride a sleigh pulled by a reindeer. Or you could go dog-sledding at the Husky Park. While in Rovaniemi, go to the Artikum museum and Taidemuseo art gallery and concert hall for local culture. The Santapark themed amusement park is fun for kids, too. Other possibilities include snowmobile safaris and viewing the Aurora Borealis at night. There are plenty of holiday villages, so you can choose to stay in hotels, apartments, guesthouses, cottages, cabins, or igloos made of glass or actual bricks of snow. For some added luxury and peace, you could stay at the Arctic TreeHouse hotel and also get a private view of the Northern Lights from your own bed. 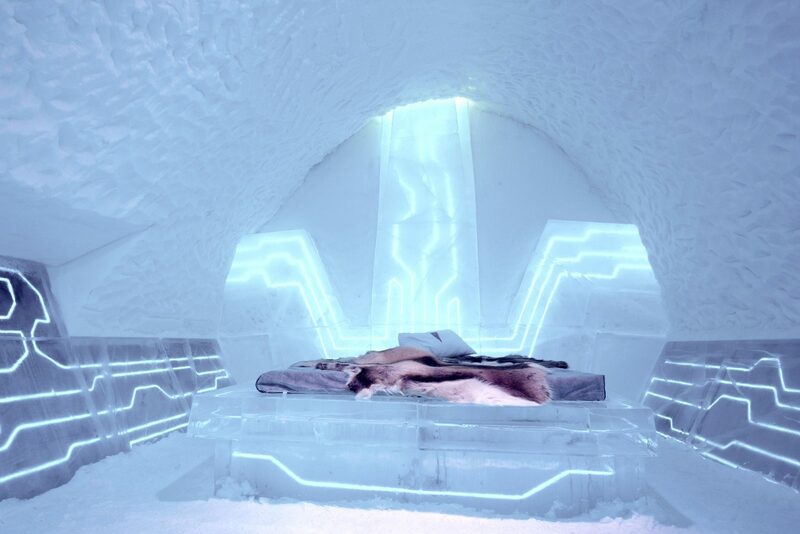 If you really want to embrace the frost this winter, you could try the unique experience of staying in a hotel sculpted in ice. While accommodation built from ice has gained popularity in other countries, the original Icehotel is located in Jukkasjärvi in Sweden. The hotel is rebuilt every year using tons of ice blocks which they harvest from the frozen Tome River. This means that the architecture changes every winter. Every room is a work of art, and the hotel also features a restaurant and bar where even the glasses are carved from ice. If you would rather not sleep on reindeer furs and ice furniture, the hotel also offers warm rooms, and advises guests to try both. In 2016, they launched the ICEHOTEL 365, with suites available all year round instead of just in winter. The toilets, changing rooms, saunas, and luggage storage are in a separate warm building to the cold rooms. Warm rooms have heated tiled or stone floors. The restaurant offers tea, lunch, evening snacks, and dinner menus, featuring local delicacies. You can take a guided tour of the hotel even if you aren’t staying in one of the ice rooms. There are many other activities, such as ice sculpting, husky sleds, snowmobiles, fishing, wilderness skills, moose safaris, and Northern Lights photography. Trentino is a lesser-known Alpine region of Italy, bordering Switzerland and Austria. It might not be as famous for winter sports as other such places, but that’s a good thing. 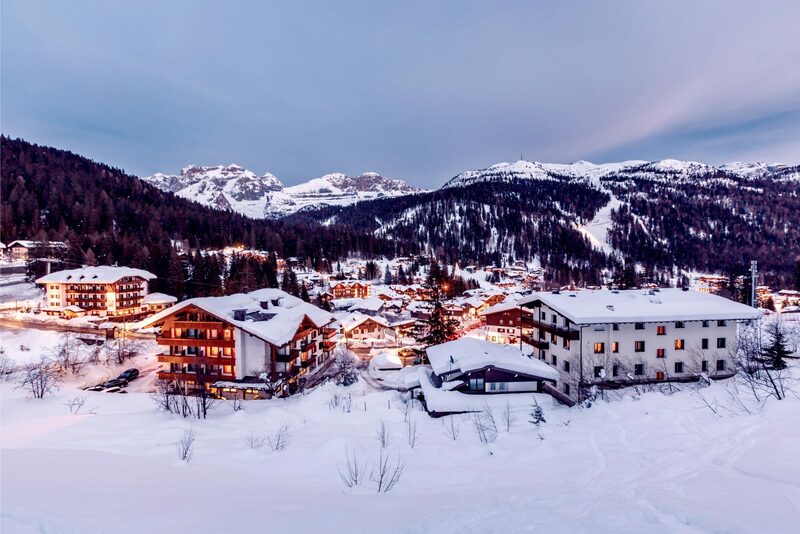 You can travel to Trentino for a snowy holiday of skiing and hearty Italian food without worrying about huge crowds. In this area, you can enjoy both modern facilities and traditional cuisine for a comfortable and authentic experience. Whether you’re a fan of winter sports or not, you can certainly appreciate the views. The beautiful mountain range of the Dolomites is a UNESCO World Heritage Site. At dusk, the sunset creates “enrosadira” or “Alpenglow” effect, illuminating the peaks with a rosy hue. When you need a break from the slopes, there are plenty of art and science museums plus opportunities for shopping and dining. Horse and carriage rides, forest walks, and magical Christmas markets will put you in the festive mood. If you love chocolate, you won’t want to miss the four-day Eurochocolate in Dolomiti Paganella in December. There is a wide choice of affordable hotels, apartments, and guesthouses to stay in. Opt for a chalet, campsite cabin, or mountain hut for added cosiness and privacy, and closer proximity to the ski slopes. Don’t forget to sample the local wines. Croatia isn’t as high on the list of European holiday destinations as countries like Prague. However, its capital city of Zagreb is a charming place to visit, especially in winter. The cobbled medieval streets are strung with fairy lights. Hundreds of thousands of lights transform Zrinjevac park and the fountains into a wonderland, with stands selling food and drink and souvenirs. In Ban Jelačić Square or Tomislavac park you can find an ice-skating rink. You could warm up with some hot mulled wine, Kobasice (sausage) sandwiches, and fritule (small doughnuts flavoured with brandy or rum). Be sure to try popular local dishes such as zagorski štrukli (cheese pastry), knedle (potato-dough dumplings with a filling of plums), sarma (cabbage leaves stuffed with rice and meat then simmered in broth), or turkey with mlinci (dried crumbled flatbread soaked in turkey drippings). Visit Tkalčićeva for pubs, restaurants, and shops, or coffee on a heated terrace. 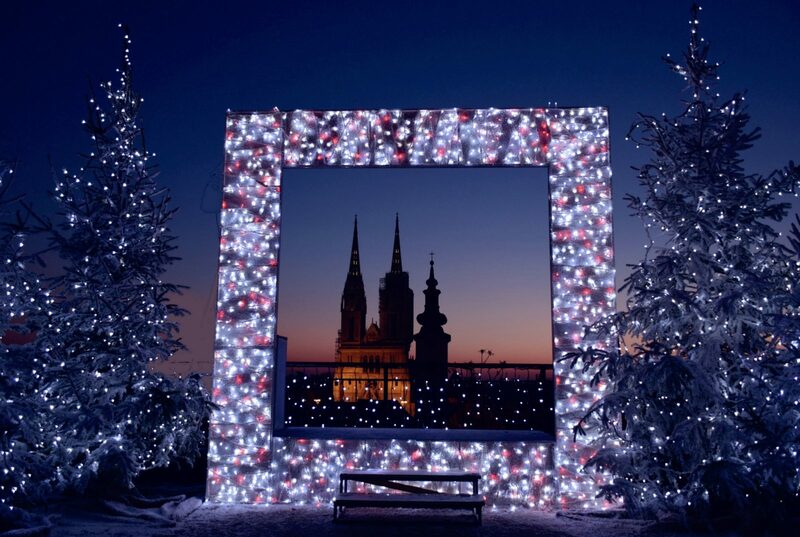 The Christmas Market in Zagreb has been voted the best in Europe for three years in a row. Their decorations and open-air entertainment are unmissable. The beautiful Esplanade Hotel offers five-star accommodation and luxury dining, with two-night VIP weekend packages available for around €500-650. 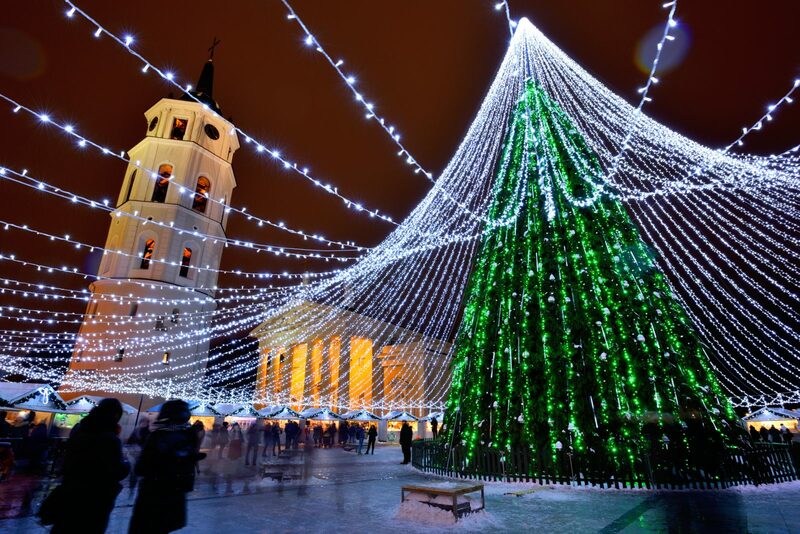 Another European city which is frequently forgotten is Vilnius, the capital city of Lithuania. It is very cold and icy, so coats, gloves, hats, warm socks, and non-slippery boots are a must. You can ski or snowboard at Liepkalnis, or just go for the elevated view. A charming view of the snowy rooftops of the Old Town is available when you climb up the Hill of Three Crosses. Winter is a great time for dining in Vilnius, because Lithuanian cuisine is heavy on traditional cooking with meat and potatoes. Soup, bread, pancakes, and dumplings are also popular, and Lithuanians are very fond of local beer. Poppy-seed cookies called Kūčiukai are traditional Christmas Eve food, often served with poppy-seed milk and sold throughout Advent. The season is marked with a giant Christmas tree in Cathedral Square and several Christmas markets selling gifts and food. There are plenty of places to shop, whether at malls or bazaars and craft fairs. You can visit various art galleries or historical and technical museums to learn about Lithuania. The architecture of the Old Town earned the Vilnius Historic Centre recognition as a UNESCO World Heritage site. Get a bird’s-eye view from the Cathedral Bell Tower or theTV tower cafe, or even from a hot air balloon up above the city. Last but not least on this list is the largest city in Northern Norway. Tromsø is 350km north of the Arctic Circle and draws tourists to see the Midnight Sun in the summer months and the Northern Lights in winter. The city is close to a refreshing wilderness with opportunities for outdoor activities like hiking, kayaking, fishing, and dog-sledding. You can even go on whale-spotting safaris to witness these majestic creatures in person. Tromsø is also a modern city, with bright nightlife and multi-cultural cuisine from more than a hundred nationalities. Many eateries proudly serve local produce, including seafood, veal, reindeer, and cheese. You could stay in a city hotel with typical Scandinavian decor, or stay outside of town in a cabin, lodge, or campsite to be closer to nature. The views will be breathtaking and you’ll have no shortage of photography opportunities. While daylight is limited at this time of year, Christmas decorations will bring light and warmth to the streets. There are lots of places to buy souvenirs, from Christmas markets to farmer’s markets and gift shops selling homemade food and handicrafts, including clothing, glass, and traditional Sami products from the Indigenous people. 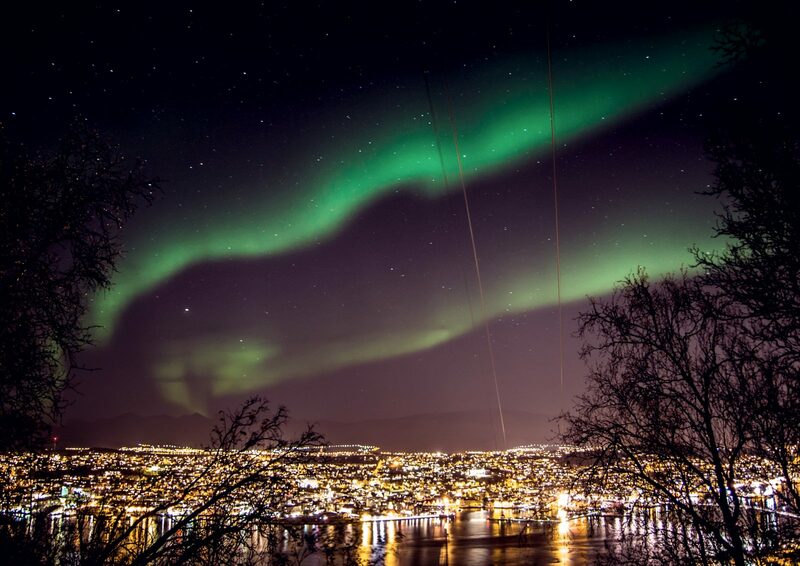 Of course, you can’t visit Tromsø without booking a Northern Lights tour. These are often available as part of other adventure packages, such as fjord cruises and snowshoeing. For some of these destinations, it is best to arrange the holiday yourselves as there may not be package holidays available from a travel agent. You can often book cheap connecting flights and easily find accommodation deals.